The business of independent motion picture production and distribution – a truly collaborative process – will reach its peak at the Miami Media and Film Market. Business and Industry leaders converge in Miami Dade County, Florida jam packed days of deal-making, screenings, seminars, networking and parties. Participants from the Global Marketplace will converge and include acquisition and development executives, agents, attorneys, directors, distributors, festival directors, financiers, film commissioners, producers, writers, the world’s press all those who provide services to the motion picture industry. CAMACOL was founded in 1965 and for the past 37 years has been the host to the Hemispheric Congress of Latin Chambers of Commerce and Industry, the state-of-the-art international business event where the international business community’s decision-makers and trendsetters all gather under one roof. 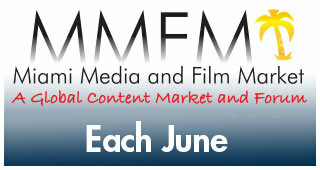 The MMFM will also host and international co-production forum to discuss new avenues of financing on both completed films and those in every stage of development and production — making MMFM the must-attend industry event. The Bitlmore Hotel, Coral Gables, Miami, Florida will be converted into a busy marketplace. Participants may request screenings of their films. The Miami Media and Film Market will be the pivotal destination for independent filmmakers and business people from all over the world to access Latin America and the Global Marketplace. Visit our Website The Miami Media and Film Market is produced by the Latin Chamber of Commerce of the United States, CAMACOL with the assistance of the State of Florida, Enterprise Florida. MMFM will be held in conjunction with the 40 Hemispheric Congress of Latin Chambers of Commerce and Industry.